A brand new online retail store offering high performance, eco-friendly bodyboarding and surfing products. All of our products are hand selected to ensure they minimise environmental impact by employing natural, biodegradable or recycled materials and by reducing packaging waste. We are proud to partner with innovative brands that work hard to protect our planet. Many of our partners directly contribute funds to charities that help conserve our fragile ecosystem. 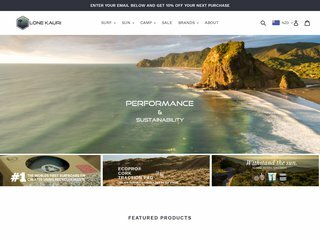 Visit the website of Lone Kauri - Bodyboarding & Surfing Products now ! Lone Kauri - Bodyboarding & Surfing Products , belonging to category "Bodyboard Shop"